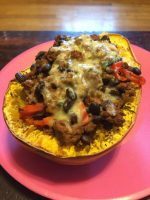 A delicious, easy to make meal with spaghetti squash! Cut and shell out the 'guts' of the squash. Drizzle some oil over the squash and bake for 45 min. Put ground turkey in a pan with a tsp of oil and brown. Throw in all the veggies, black beans and taco seasoning. Sauté until veggies are tender and meat is cooked through. Once squash is done, fluff the edges of it pulling the strands away from the sides but not removing it. Load the turkey mixture into each boat and top with even amount of cheese. Bake for another 10 minutes and serve hot.